The revamped 2017 Elantra marks the sixth generation of Hyundai's compact sedan, and it returns in prime form to do battle against other best-selling rivals like the Honda Civic, Toyota Corolla and Nissan Sentra. As with the rest of Hyundai's lineup, the Elantra boasts stylish looks, premium amenities and a class-leading warranty that includes 10 years/100,000 miles for the powertrain. The Hyundai Elantra takes about 11 gallons of gas which is $27-$30 in gas. The 2017 Hyundai Elantra limited is a great car! When choosing this car, I compared it to other models and makes and the value of the Elantra was much better and cheaper than the others with similar and better features. I love the fact that the car comes with features such as apple carplay and is great on gas. The car is roomy and has great features for a car that is not considered "luxury". This is definitely a car that Hyundai upgraded in 2017 without upgrading the price to a ridiculous amount. I would recommend that anyone who is looking for their first car or a car that they can keep for years buys this car. You will not be disappointed. 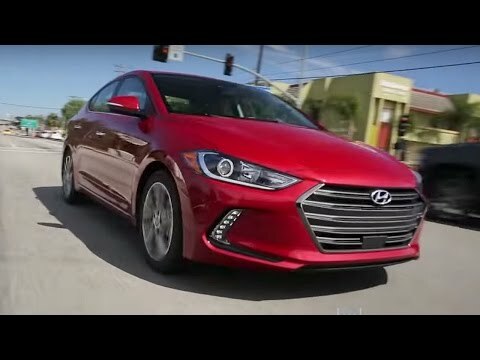 Hyundai Elantra get a sporty hatchback. So far I haven't had any problems with this car. The gas mileage seems to be really good and I like the feature that tells you about your average mpg. The driver's seat is very comfortable and able to be adjusted to your personal needs. The car is able to get Sirius which is nice if you are willing to pay the fee. The display for radio is big and shows a lot of detail on what you are listening to. The car also has buttons on the steering wheel allowing you to change the volume and channel without having to move your hands. The car also has an eco mode that makes me feel like I am doing a good job on saving gas money. My vehicle has been really good so far. I have had it for about 6 months now and haven't had any problems. It drives really smooth and does not make any noises when starting or driving the car. Sometimes when driving I do not realize how fast I am going because of how smooth it is! It is been very safe for my two little ones. They both have car seats and they fit very comfortably even with extra room. The trunk is a very good size. I have been able to fit all of my beach chairs, towels, toys, swimmier and tent in it. I definitely recommend the Elantra to anyone who is looking for a safe reliable car for their family.